Michael McFadyen's Scuba Diving - Avaavaroa Passage The southern side of the island of Rarotonga in the Cook Islands is not dived as often as the other four sides. This is for a number of reasons, the primary ones being that it is a longer run from the normal boat launching sites in Avatui Harbour and Avarua Harbour which are on the northern side of the island and because the southern side is more open to adverse weather. To dive on this side of the island, Cook Island Divers took us by vehicle from their base on the western side of Rarotonga past the Rarotongan Resort to just west of Vaimaanga. We launched their smallest RIB (ridged infatable boat) aross the sand into the small lagoon. It was a slow and careful trip to the Rutaki Passage which gives access to the open sea. This is a passage that is only suitable for very small boats like RIBs as the passage is very narrow and in spots there are coral bommies that need to be avoided. Once in the open sea, you head east and skirt along the outside of the fringing coral reef till you are off the larger Avaavaroa Passage. This is located between the villages of Avaavaroa and Titikaveka. You anchor on the eastern side of the passage (it is about 10 minutes from the beach). Care needs to be taken on this dive as you are quite close to the reef and during large seas (and high tides), a lot of water exits the passage, creating currents. This is normally only on the surface but could reach the top of the reef in this area. After descending, you will see that the depth is about 12 metres. Right next to the reef the passage is about 15 metres on the bottom. The passage gradually slopes to about 30 metres. There are walls on either side, creating a sort of gully. Once you reach 35 metres you will notice another gully coming in from the left at 45°. At this spot you are on the outside of the reef and the depth drops off to 45 or 50 metres or so. 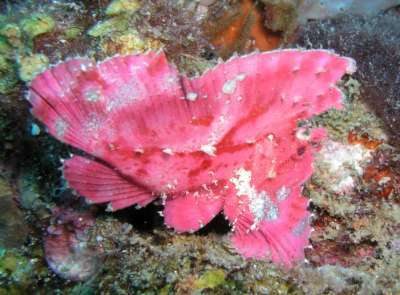 Around here this is a leafy scorpionfish. When I saw it, it was under a piece of dead coral and I could not get a useable photograph. The fish here was a lot darker than the one I saw at Port Moresby which is the photo above. You can head left or right along the reef, although due to the depth you will not have much time to explore. There are some grey reef sharks in this area. After you go a few minutes to the east, you can go up over the reef to about 20 metres and back into the second gully you encountered. The bottom is about 25 metres. Cross the gully and go up the other side and if you are heading north-west you will come up to 16 metres. The main passage is ahead to your left and the depth is about 21 metres. Head back up the gully to the anchoring spot. Like all the other spots I dived in Rarotonga, the coral here is not very good. I estimated that there was only about 10% live coral. I also saw no sponges at all and not even a tiny gorgonia (let alone a huge one like seen in many South Pacific Ocean countries). Fishlife was generally sparce. 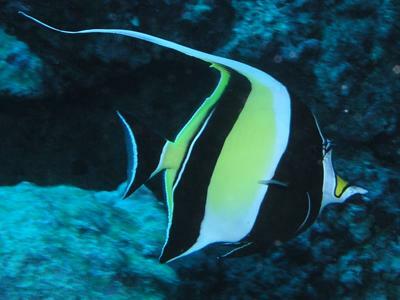 We saw a few surgeonfish and trevally, some different butterflyfish (threadfin, longnose) and a few Moorish idols as well as some triggerfish. The one good thing about this dive was the visibility, in excess of 40 metres. Water temperature in June was 23.5° and air temperature 23-25°. On the dive I did here we had very large seas so it was a bit uncomfortable in the above 25 metre depth range due to the surge.